Our reliance on the Internet and web connectivity is such that the router plays a key role in modern homes or offices. Whereas an ISP-provided box used to fit the bill, it now makes sense to consider an upgrade offering additional features and increased performance. There's plenty of choice, ranging from single units touting ultra-fast speeds to multiple units promising complete mesh coverage, but which router do you choose if gaming is your primary concern? 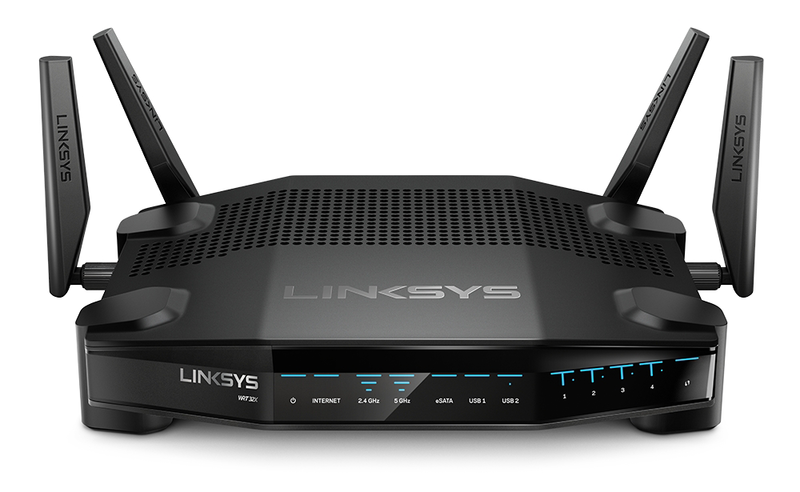 Gaming routers have traditionally offered little to differentiate themselves from regular models, but Linksys is hoping to set the record straight with the WRT32X, a unit we're told has been "engineered purely for gaming." 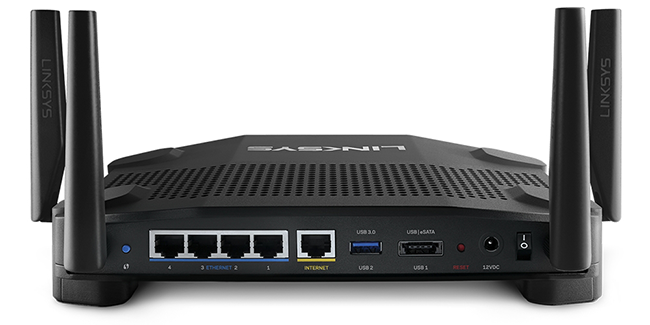 Priced at a jaw-dropping £300, the WRT32X is the first router to incorporate Rivet Networks' Killer Prioritisation Engine (KPE). That's right, the Killer Networking tech we've previously shown to be beneficial on wireless adapters and Ethernet controllers has finally been ported to the hardware on which it makes most sense; the router. Both Killer Prioritisation and Linksys WRT are products with enthusiast heritage, and the marriage on offer from the 32X appears to be a match made in gaming heaven. 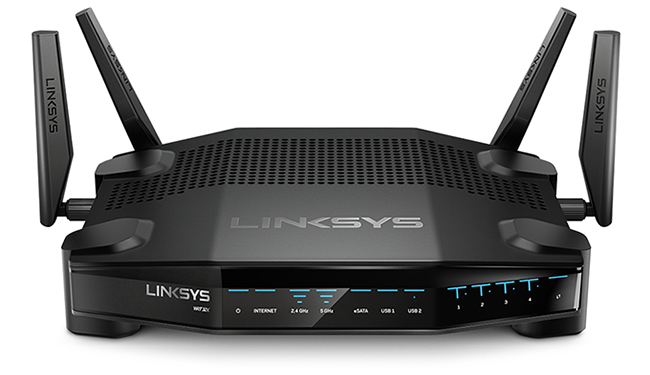 We know from our own sources that Killer had toyed with the ideal of developing its own router, but when Linksys came along, the opportunity to collaborate proved too good to ignore. For this first outing, Linksys is using a tried-and-trusted foundation as the Killer-enabled router is effectively a refreshed version of the existing WRT3200ACM. Measuring 246mm x 194mm x 52mm excluding antennas, the WRT32X is a chunky unit whose aggressive stance is offset by an all-black colour scheme and stylish blue LEDs lining the glossy front fascia. Plenty of mesh venting helps keep the unit cool during use and every available port is tucked neatly around back. These include four Gigabit LAN, single Gigabit WAN, USB 3.0, USB 2.0/eSATA and a connector for the external power supply. 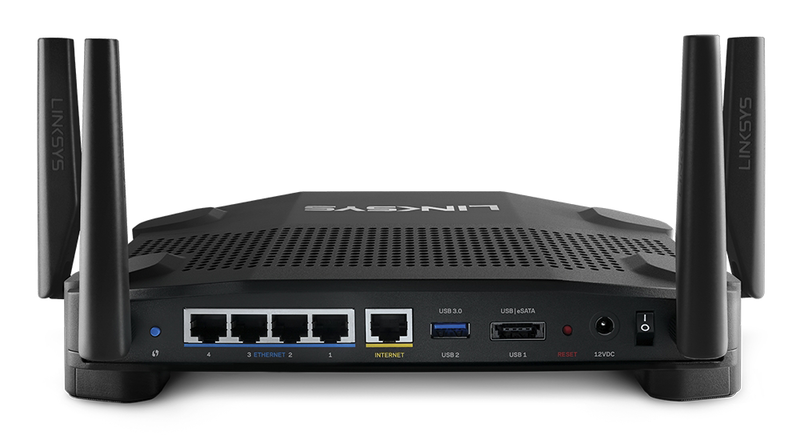 On the specification sheet, Linksys offers most of the goodies you'd expect on a modern high-performance solution, including a 1.8GHz dual-core processor, MU-MIMO for simultaneous transmission to multiple clients, and four high-performance antennas offering dual-band speeds of up to 3,200Mbps (N600 + AC2600). Such features are available from a long list of more affordable competitors, yet the WRT32X has a few extra incentives up its sleeves. 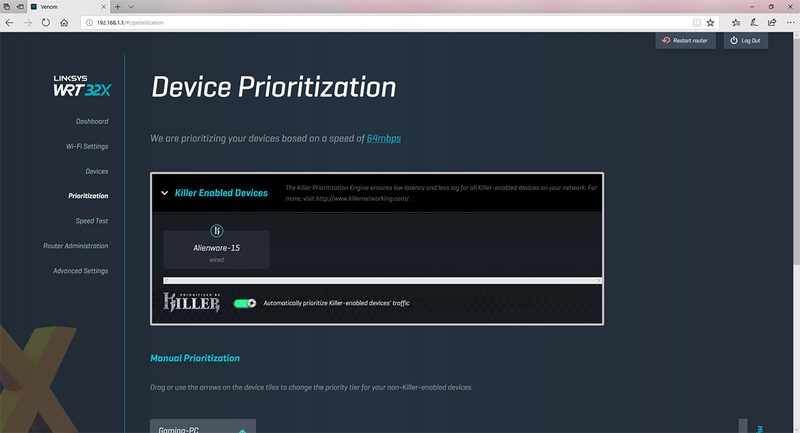 The first is a new firmware and user interface. Built exclusively for the WRT32X, the new software is one of the reasons why the router is late to market (it was first announced way back at CES in January) but the extended period of development appears to have paid dividends. We've seen our fair share of router admin panels that are cluttered and uninviting, and it is refreshing to see Linksys pay attention to the WRT32X's consumer focus by implementing a graphical user interface that's among the best we've seen on a device in this category. 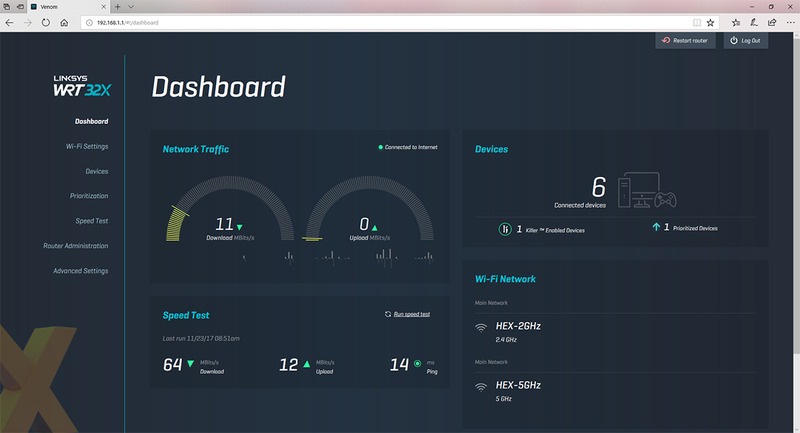 Setup is a doddle - simply point the browser on any networked PC to myrouter.local (or 192.168.1.1 if you prefer) and follow the on-screen wizard - and you'll be connected to the web and introduced to the Dashboard in a matter of minutes. 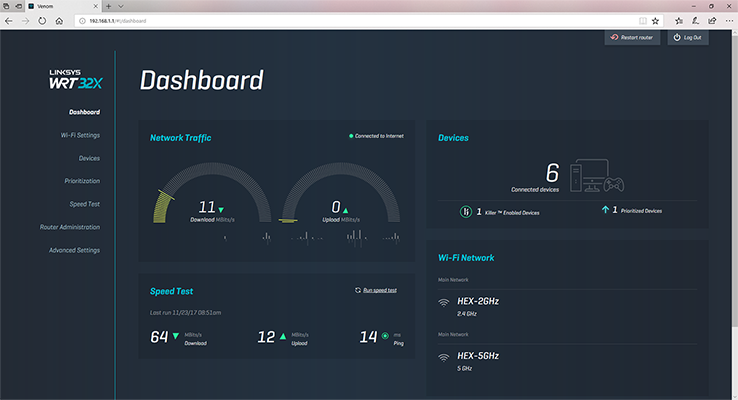 From here you can monitor network utilisation, the number of connected devices, WiFi status and line speed via a built-in test. Linksys' streamlined interface helps navigation feel fast and fluid, with a simple menu on the left and all the various options on the right. 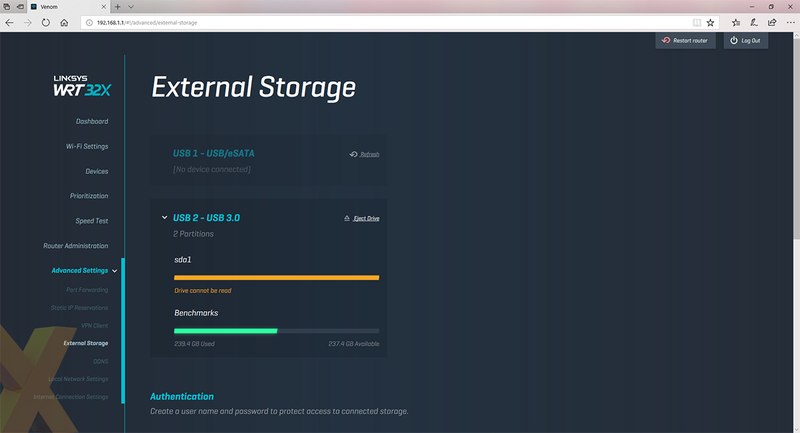 Familiar features such as external storage, port forwarding and IP reservation are easily found, and Linksys has dedicated an entire tab to the router's key area of focus: Prioritisation. 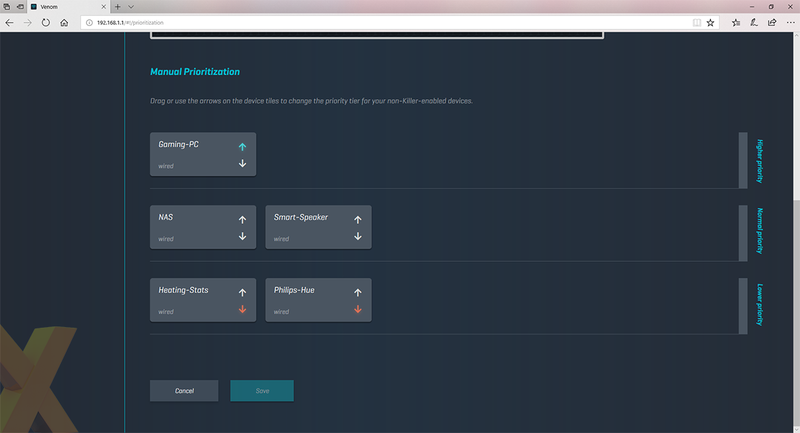 From here, non-Killer devices can be defined as high, medium or low priority using simple arrow buttons to move up and down. This sort of traffic management is available to competing routers, but the WRT32X sets itself apart with automated prioritisation of Killer-enabled devices. 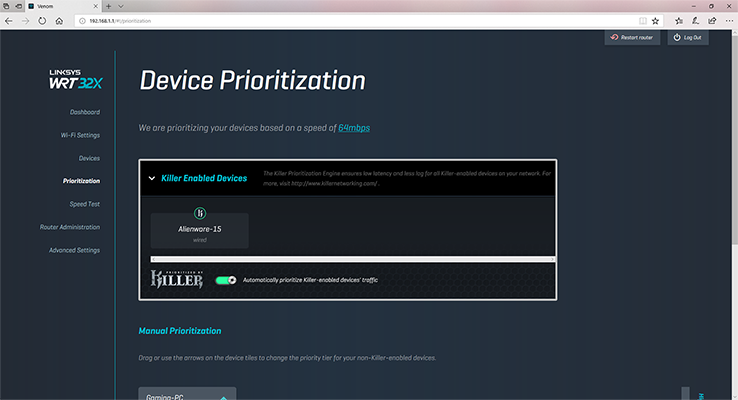 The router instantly recognised our Alienware 15 laptop, giving it priority over all other devices on the network. Why does this matter? You could argue that today's fast broadband speeds offer enough bandwidth to deal with multiple users in the home, but for enthusiast gamers there is a need to maintain low latency at all times. WRT32X is designed to identify latency-sensitive traffic from a Killer-enabled device, be it a game, video stream or Skype chat, and give it priority over all other traffic on the network. In theory, that should mean consistently low pings and fast gameplay irrespective of the kids watching Netflix and the NAS pulling down torrents. Let's see how it plays out in the real world.